Got nothing to do tonight? Live in the New York area? Hit up the Fünde Razor II. 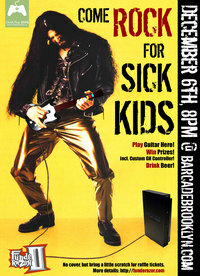 This is an event put on annually by Gizmodo's own alum, Joel Johnson, at the Barcade in Brooklyn, New York. At the event you can play some Guitar Hero, drink some mighty fine brews and also play classic arcade games. There will even be gaming competitions and a ROFL RAFL with proceeds benefiting The Children's Hospital of Montefiore in the Bronx, via the Child's Play Charity. There is no cover to enter the event, but bring some dough for the raffle and prepare to rock out. Hit the link below for more information.